Hide deals from seller "The Coffeecake Connection"
Limit 1 per person and 1 per transaction. Valid toward any coffeecakes or cake-a-lettes. Tax and shipping not included. Voucher must be redeemed through claim link and with code (both provided on voucher after purchase). Cannot be redeemed via phone. Full value of Gift Certificate must be used in 1 transaction. 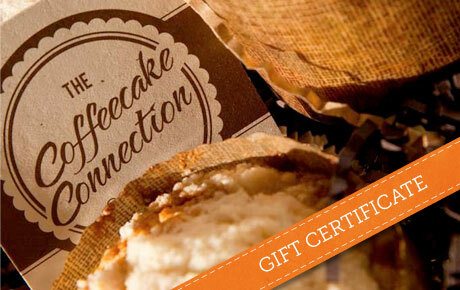 Sweeten someone's day with 50% off a $20 Gift Certificate to The Coffeecake Connection, available nationwide. This online retailer bakes and ships fresh, preservative-free coffeecakes that make tasty, convenient treats. Christine Welch, owner of The Coffeecake Connection, developed a love for baking at a young age. She started The Coffeecake Connection to share her passion and bring others together with the comfort of a fresh-baked coffeecake. Their signature coffeecake is made with seven core ingredients and is topped with a sweet and crunchy streusel. They offer other tasty flavors like triple berry, raspberry white chocolate and banana butterscotch. The Coffeecake Connection also sells "cake-a-lettes," mini, individual-sized cakes that are available in all the same great flavors. As a final touch, each cake is giftwrapped, making it a perfect gift. An online provider of gourmet buttermilk coffeecakes.